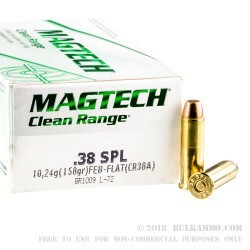 For those who have little tolerance for lead exposure, or for those that have tight regulations in their area regarding public lead exposure: this is a very nice alternative to your standard factory range loads for the .38 Special round. It’s a bit more expensive, but it may easily be justified due to the serious improvement in shooting atmosphere that it can effect – specifically in indoor range settings. 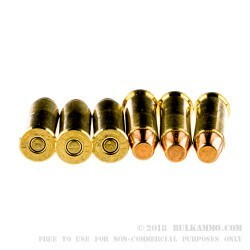 This is a fully enclosed base projectile, which means that the burning powder behind the bullet as it travels through the bore and out into the air, cannot produce microscopic lead burn-off that can be dangerous to shooter over time. It simply cannot reach the lead core of the bullet with the type of heat necessary to turn the solid into a particulate. 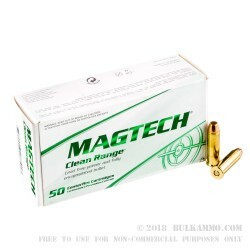 Another important build aspect of this MagTech “Clean Range” ammunition is the lead-free primer, which reduces the same type of exposure. The powder is also a premium powder which means you don’t get the huge smoke cloud with every pull of the trigger. Instead, you breathe easier and you can rest assured your exposure to lead is significantly reduced. 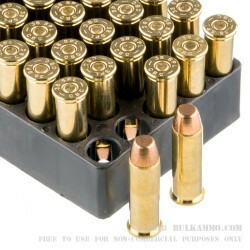 This is a FMJ (fully enclosed base design) 158 grain load in a reloadable brass casing.